015, archaeologists discovered the remains of stone-walled slave quarters on the site of the historic Belvoir plantation in Maryland. 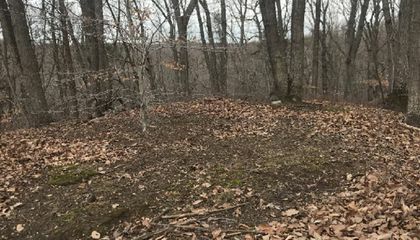 Now, as Tara Bahrampour reports for the Washington Post, in a remote and wooded area on the property, experts think they have found a cemetery where the plantation’s enslaved were laid to rest. The Belvoir tobacco plantation, which is located near Annapolis, was once owned by the relatives of Francis Scott Key, the slaveholding lawyer who wrote the lyrics to the Star Spangled Banner. Ever since the slave quarters were unearthed at the site, Julie Schablitsky, chief archaeologist for the Maryland Department of Transportation State Highway Administration, says she’s been inundated with calls about potential discoveries in the area. One of them was by Rodney Daff and James Brown Jr., who grew up on the Belvoir plantation in the 1970s. According to a press release from the Maryland Department of Transportation State Highway Administration, the two men alerted Schablitsky to the possible existence of a cemetery on the property. When Schablitsky visited the site, she observed for herself the crumbling tops of eight fieldstones, which were often used to mark the sites where enslaved people were buried. On the ground lay what appeared to be a marble headstone, broken in two, its engravings no longer visible. Schablitsky found yet another tantalizing clue nearby: a rectangular depression in the earth that faced east to west, which is often how graves are oriented. In late February, Schablitsky was joined by Anne Arundel County archaeologist Jane Cox and five descendants of individuals who were enslaved in Belvoir. Three cadaver dogs also made the trip. The dogs are able to sniff out the presence of human remains that date back 200 years. When they reached the rectangular depression, all three dogs lay down—a sign that they had detected decomposition. They signaled at several other locations as well. There are a number of ways that archaeologists can learn more about what lies beneath the soil, according to E.B. Ferguson III of the Capital Gazette. They can look for and test bones, examine coffin hardware and even study seeds in the graves to determine what kinds of flowers were placed there. At the moment, though, there are no plans to excavate or test the area. For people like Wanda Watts, who has traced her own ancestry back to enslaved families who lived at the Belvoir Plantation​, simply knowing about the existence of a cemetery brings tremendous relief.